I set this property Off, but do not show error and say again please set attribute to On your CustomError. when I set mode to On,say Please set customErrors mode to On Again. When you're having issues with configuration, make sure that your settings isn't overridden. In this case, your server might have a configuration <deployment retail="true" /> that overrides application settings and disables trace output, custom errors, and debug capabilities. Change the value to "false"
From your description it's already likely it was placed there by you or automatically generated another way. Also try setting to On and restart the Application pool. You can do this by simply modifying web.config file by adding a break return or even just hit the space key, as long as you've made a change. Now re-upload making sure this is your second time with the customErrors mode was set to On. Hopefully you can now view your custom error page. If you are still having problems, and have access to your web site from IIS Manager try editing the .NET Error Pages in Features view. That will also do the same thing, providing your custom error page is in the correct directory for the web.config file to access. NOTE: Ensure that On starts with an upper-case O. By changing the web.config this should (by default) recycle your app pool and be picked up straight away. Here is sample code how you can display exceptions on custom page. Compile and start with Default.aspx. Click your button and error will be shown on your custom page. I just wanted to comment here, but I do not have enough point to comment, Can we see the actual, page that produces the error and see the entire web.config? you can blur out the connectionstrings and such so as not to give any passwords away. I think from what you are saying you are using IIS Express debugging on local machine. I would done IIS Express, or ctrl+F5 the page to see if the site is just not cached. 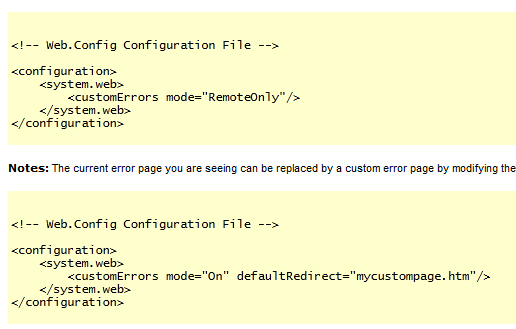 Custom Errors Off - Specifies that custom errors are disabled. This allows display of detailed errors. I've never seen it say set to On. I've seen it say set customeErrors to off which will give you detailed errors. Set it to off and then add the actual error message you see to this post. Are you positive your not getting a different message like a 404 error? 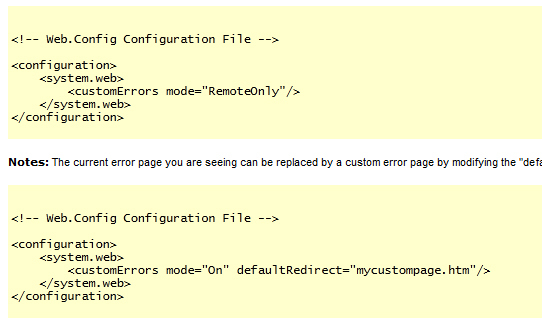 From what I can see, you don't have the <customErrors mode="Off" /> as the first node in the <system.web> node. If I were to guess, you have the customErrors node inside a <compilation targetFramework="x.x"> node. You probably have the applicationpool set to another version of the .NET framework than the application is written in. Make sure the <customErrors mode="Off" /> node is the first inside the <system.web> node, then it will most likely give you the detailed errormessage. removing this line works for me! Many hosting companies actually override the settings from your web.config file by theirs. You can usually set these concrete attributes in the web host's dashboard for the website. If you tell us the concrete web hosting you are using, we should be able to assist better with concrete steps. Not the answer you're looking for? Browse other questions tagged asp.net asp.net-mvc asp.net-mvc-3 web-config or ask your own question. How to override page render for an error page? Did Mueller's report provide new evidence for the claim of Russian govt election interference via social media?